“I think I know you,” said the elderly lady pushing the grocery cart. I stopped, checked to make sure she was addressing me, before I studied this woman. Could it be her I wondered. I think it is. “Mrs. Rummel?” I questioned. A welcoming smile told me I was right. This was my high school home economics teacher. I was in her class forty-six years ago. I have changed quite a bit from those high school days, particularly my hair color. She did not recognize me from those days. I met up with her about twenty years ago because her granddaughter was a fifth grader at the school I taught at and her daughter-in-law also taught there. She recognized me there and remembered my brother played basket ball with her son. She quickly caught me up on her daughter-in-law and granddaughter. The granddaughter is a teacher too, and she has two children. Hard to believe so much time has passed! I can’t say I accomplished my goal in that class, but over time I do have a few items I can make without a recipe. 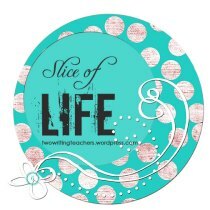 I have spent a lot of time in the kitchen over the past forty years. However, a recipe is always nice to have at hand. Can you ever go back to a previous time of your life and savor the experience? This photo sends me spiraling back in time to almost fifty-two years. I am the fifth person on the front row. I think I was eight. My family lived in a suburb of Chicago, but every summer we would travel from Chicago to Baldwin, Wisconsin. It was a grueling trip, five kids, two adults, no air conditioning. This trip took us all day, but in the end we landed at grandma and grandpa’s house. Fun times were ready to begin. There were aunts, uncles, and cousins galore. Kids were shipped off to spend time with the cousins. Kids and parents met up once again at church on Sunday. After the service everyone headed to Grandma and Grandpa’s house where a feast was set up on picnic tables in the side yard. 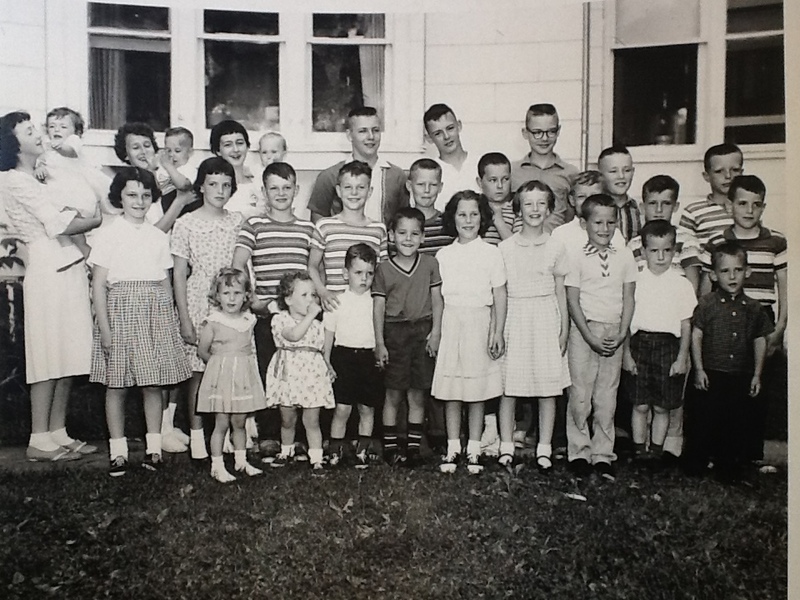 At some point the cousins all had to gather in one place for the group photo on the side yard of grandma and grandpa’s house. Those where the best of times that live on in my memory. Last fall I returned to Baldwin for the funeral of an aunt. I had my husband drive past my grandparent’s house. Decades ago they left this house (before they died), but it always remained firmly visualized in my mind. The house my eyes viewed, was not the house of my memory. This house was beaten down, there was no life spilling out onto the lawn. Weeds sprouted, screens were torn. It had not been loved in many years. I think I will hold onto the memory of the home where twenty-nine grandchildren lined up to preserve a moment in time. Working in fourth grade and developing a story with a climax allowed me to bring back a memory from many years ago. 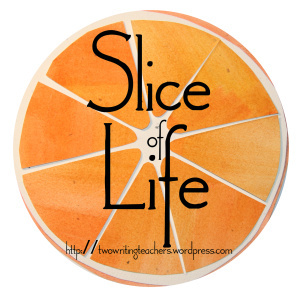 I share my story as a slice today. I’d been looking forward to this day for several years. Our family was flying out to meet other family members in Colorado for a mini-skiing vacation. The car was pack with skis, ski boots, ski bibs, warm gloves, and plenty of sweaters. We were leaving an hour before school was out, so everything had to be ready and in place for a quick escape to make it to the airport on time. Even though I was excited and feeling impatient to get going, I still had to get through the day of teaching. I was teaching a math lesson in my fourth grade class one cold day in January. “A splinter? Why don’t you just pull it out?” I said to her. Thinking to myself, What’s the big deal? “I think you’d better see this first. It’s not that simple,” she replied to me. I gathered my class together for a restroom break, so I could see this splinter. This splinter that is not so simple. I couldn’t believe she was making such a fuss about a splinter. When I saw the splinter, which was more like a dagger of wood, my stomach dropped and I wondered how this day would go. I was staring at a triangular chunk of wood sticking out of my son’s stomach. My heart was racing, I stopped breathing, my knees were about to give away. “What were you doing?” I managed to get out in a whisper. “I was sliding down the staircase on my stomach on our way to art. Everyone does it all the time,” David replied in an unconcerned voice. My heart sank with those words. I wondered if our trip would be cancelled. I worried David would need surgery. Someone came to take my class for the rest of the day, while my husband, my son, and I hurried to the nearest emergency room. As soon as we arrived at the emergency room, we explained our situation to the nurses. Fortunately they were not too busy. An x-ray revealed that the splinter was not embedded in any organs. The doctor arrived and quickly pulled the splinter out. David was bandaged up and we were on our way to the airport. Colorado here we come! When I got up that morning, I thought the excitement of the day would be once we were on our trip. I’ve learned that sometimes your day doesn’t turn out like you thought it would. Have you ever had a number jump out at you and take you back to a place from your past? Last week as I headed for my home (away from home), I passed a gas station and noted that the price of gas had risen during the day. Seeing that price made me gnash my teeth, because I needed gas and it had jumped twenty-three cents from the morning. However, it wasn’t the actual price of gas that made me gasp, but the numbers 314 (yes, there was a decimal in there). Immediately I was back in my French teacher’s classroom. This was his room number. I could clearly see the the windows that belonged to his room. I could see the staircase I climbed for four years to enter his room. I could hear his voice, “Bonjour, mademoiselle. Dites-moi que chose intéressant.” (Tell me something interesting.) This was the standard greeting every day. Of course, I had to have something ready to share (in French). Often I struggled to find something he would deem interesting. He was not a teacher I wanted to disappoint. Ask me what room number was my English class. I have no clue. I can’t even recall what floor the class was on. The same is true for all classes. How odd that this one number has stayed with me over forty years and every time I see it, it takes me back to high school. Perhaps it was because it was a room I visited every day for four years. Or could it be that I looked forward to this class (most of the time)? Mr. Bowman (I still can’t call him by any other name) required a book report by a French author every quarter. He let me fall in love with The Hunchback of Notre Dame, The Three Musketeers, and The Count of Monte Cristo, but the best was Les Miserables. I have never read The Little Prince in English (I suppose I should). Le Petit Prince sent me on a journey to see a baobab tree (which I saw in awe in Singapore). I was immersed in all things French for fifty minutes a day. It became my goal to visit the Louvre, see the Arc d’Triomphe, and savor the impressionist paintings at the d’Orsay. Mr. Bowman made it sound magical. And it was. But I’m still ready to head back to France and discover more. The number 314 means so much more to me than just a number. It has the power to take me back many (should I say many, many?) years. A few weeks ago, my husband and I attended a surprise birthday party for a friend who just turned 60. When we got the invitation, I took a mental trip back down memory lane to when my husband and I met Leslie and John. Mike and I were married in June and now it was August. It was time to get our classrooms set up in this new school where we both had jobs. I was at the rental house unpacking boxes when Mike came in from his trip to check out his classroom. “Met a guy named John. He and his wife teach here too. He wanted to know if we played games,” my husband said. “What kind of games does he mean?” I replied, worried that he was talking about games I had no interest in (this was the 70’s, not that far removed from the sexual revolution of the 60’s). “I’m not sure, but he wants us to come over to meet his wife, Leslie, tonight,” he said. So with a bit of trepidation I went and found that the games he played were games we played. We spent many an evening playing cards and board games since we were too poor to do much of anything else. The next year another couple joined us playing games. We spent twenty years together as best friends and co-workers. We went through a lot, as we added children to our group. These people know us in ways no one else does. These are friends for life. Stacey hit the nail on the head when she said friendships recharge our spirit. Our spirit was recharged the night of the party as we reminisced with friends that we haven’t seen in a while. The Christmas card update letter can only do so much. Being there was important for the birthday girl, but also for my soul.